Roy Dineen Agri Design has developed an enviable reputation for delivering comprehensive farm building solutions for his customers. Vastly experienced, Roy has the knowledge and expertise to design quality buildings at an affordable cost while planning permission applications are all part of the service. • Can the design of your farm facilities reduce your labour? • Do you need an extension to your slatted unit, milking parlour or any farm building? 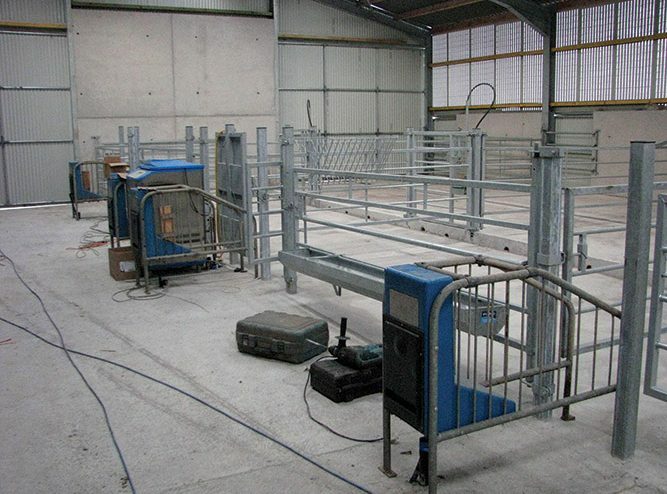 • Are your cattle handling facilities incorporating cattle crushes and drafting pens safe and easy for you to manage? • Would you like your Full Planning Permission documentation prepared and submitted for you? If the answer to any of the above questions is yes then look no further than Roy Dineen Agri Design of Dromkeen West, Causeway, Co Kerry because there are few more suitably qualified people than Roy when it comes to designing quality and functional agricultural buildings. Good facilities allow farmers to expand production and incomes and add to the asset value of the farm. They also lead to a better quality of life for the farm family by reducing the workload. Any farm building is a major investment. It needs to be well designed, comply with planning requirements and be built to a good specification. Roy is an expert when it comes to designing buildings tailored to the individual requirements of each farm yard and has built up extensive portfolio of successfully completed projects in the Kingdom. From the initial planning and design stage through to the planning permission application stage, Roy can guide you all the way. A native of Dromkeen West, he hails from a farming background and acquired a wealth of experience through working in the Farm Development Services section of the Department of Agriculture for 40 years. Roy fully understands that every building has its unique requirements and he can tailor the building to suit these specific needs. He designs structures that are fit for purpose and a priority of his work is, as already mentioned, to reduce labour on the farm, and allow the farmer more quality time with his/her family. “Where possible I come up with more than one solution to suit the needs of a particular farmer and together we then decide on the one design that suits best. It’s important the customer is 100% satisfied. I believe I deliver quality plans that suit farmers’ needs through my experience of this sort of work. Planning permission is most likely to be required for most farm structures, and I prepare plans, elevations, cross sections, site lay-out plans and ordnance survey maps to scale as well as newspaper notices and site notices for this purpose. Well known throughout the North Kerry farming community, from Tarbert to Ballyheigue to Tralee, distance is no object for Roy. His popular Facebook page, Roy Dineen Agri. Designs, has many of his Sketch Up drawings and photographs from past projects available to view. “Things are picking up now, as it was slack during the fine weather. I’d suggest that was due to the harsh winter and the considerable stress and pressure that farmers were under at that time. Now they have started to plan for next year and there is more demand for my service. Make the right choice when you are thinking of a considerable investment like this and call Roy Dineen Agri Design. Time seeking his advice is time well spent.